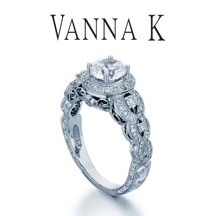 The intricate vintage design of this diamond engagement ring from Vanna K's Hand-Crafted Collection sets it apart from anything you've ever seen. Set in 18K White Gold, the 1 Carat round center is mounted on a pedestal, surrounded by a circle of round micro-paved white diamonds. The hand-crafted band's design weaves together delicate ropes, all encrusted with diamonds, like a princess' tiara. Give her something that will feel as extraordinary and precious as your love.